Chobham Club has become too expensive to keep running. 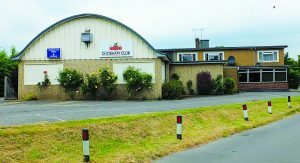 THE only hope of keeping Chobham Club open is to demolish the building and replace it with smaller premises and some houses, its members have decided. The clubhouse in Windsor Road, which was built in the 1960s, has become too expensive to run and needs repairs which the organisation cannot afford. Its committee has applied for planning permission to knock down the building and put up a new clubhouse and eight homes on the site. Lack of insulation and solid concrete walls mean the heating bills are high, adding to the club’s financial plight. Membership has also fallen in recent years, as lack of money for maintenance has made the building unattractive. The plan is to build a new clubhouse at the southern end of the site. It would have the feel of a modern “local” pub, with facilities which would attract more people to hire it for parties and public events. The current main hall and clubroom would be replaced with a function room and bar area, with a kitchen, meeting room and toilets. There would be two flats above the club area, whose rents would provide financial support for the club operation. For the northern end of the site, the club has applied to build a terrace of four three-bedroom homes and four detached houses. The housing would provide the money for the clubhouse rebuild and funds for investment to help keep the club running in the future. The club committee stresses that it wants to make its premises more suitable for community use and keep the building going as a facility for the village as a whole. A workingmen’s club was first established on the Windsor Road site in 1926, when a former army hut was donated for such a use. The wooden building was eventually replaced by the current prefabricated building with a felted roof in the 1960s. Two planning applications for the redevelopment, one for the clubhouse and one for the housing, are now with Surrey Heath Borough Council.